In just 20 days, B and I will be headed into New York City for BlogHer 2010. Now, B’s been to a blogging conference before, Disney Social Media Moms, but I’ve never been. I did go to PC Expo years ago but I’m guessing that a mid-90’s computer show will be very different than a 2010 blogging conference. 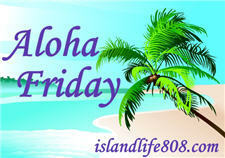 My Aloha Friday question for today is: Will you be at BlogHer? Have you ever gone to a blogging conference before? So glad you all are going too! I hope we can meet up at BlogHer! No, I will not be attending BlogHer and have never been to a blogging conference. But, I hope to some day have the opportunity to do so. I won’t be there. BOTH of my kids have birthdays that week! I have never been to one. Maybe someday I will. Maggie @ Tethered Mommy recently posted..Orglamix Natural Mineral Makeup – Review and Giveaway! I have never been to any blogging conferences. I think it would be a lot of fun. No not attending. I am hoping they come to the west coast in the future. Not this year! I have never been to a blogging conference, maybe someday. I will not be at BlogHer and I have never attended a blogging conference.